Canções e Sambinhas is the third of a triptych of compositions written for my friend, the enormously gifted cellist, Andrés Díaz. The first was Eurydice, a "tone poem" on the Orpheus myth for cello and orchestra, and the second was La Chimera Fantastica for the Díaz Trio. 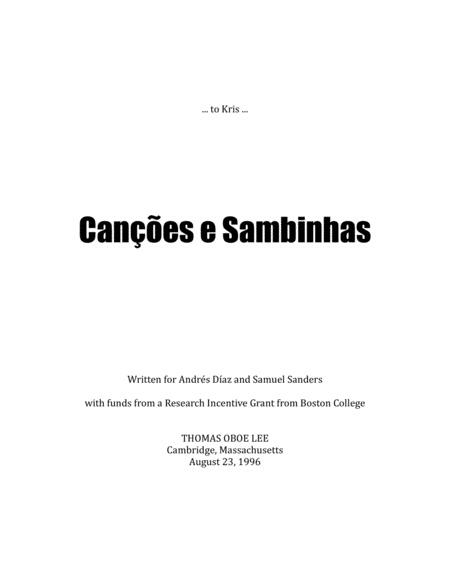 Canções e Sambinhas is in four movements. 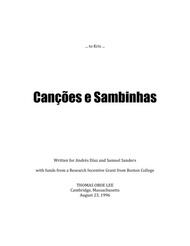 Having lived in Brazil during my teen-age years, I inevitably continue to return to the wonderful music of that country for inspiration: the chôros of Ernesto Nazareth, Jacob do Bandolim, Pixinginha, and Heitor Villa-Lobos.The first movement begins with a slow, dark introduction before the "love song" emerges .... The second movement is a lively samba. As the title indicates, it is a little samba infused with Bach-like counterpoint, although a bit crazier. Villa-Lobos might find this amusing .... The third movement is a slow meditation for the cello on a passacaglia-like theme in the piano. The last movement, "Mais uma vêz" (meaning "One Mo' Time" in English), is a samba like the second movement, but it is set more homophonically, more dance-like in character ....The work is dedicated to my wife, Kris, who is an inspiration to my life and work. Audio link. Copy and paste the URL link into your browser.